The squadron now known as VF-74 was established on the 16th of April 1944 as VBF-20, flying F4U-1 Corsair's from NAS Wildwood, New Jersey. After six months they transitioned to the F6F Hellcat, but very quickly changed from Hellcats to F8F Bearcats. While flying the F8F the squadron was redesignated as VF-10A on the 15th of November 1946. VF-10 ABLE were part of CAG-9 onboard the USS Philippine Sea (CVA-47) and made their first deployment, to the Mediterranean, between February and June 1948. Before the cruise VF-10A had shifted to their new shore base of NAS Charleston, Rhode Island. 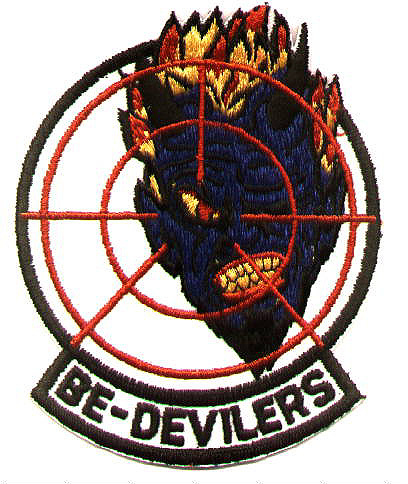 Also before this cruise the squadron adopted their devil's head insignia, created by Ensign John P. Humphries. After four years as VF-10A the squadron was redesignated as VF-92 on the 12th of August 1948, but remained with the same air group and aircraft. Within 18 months, in December 1949, CAG-9 was decommissioned and VF-92 moved to become part of CAG-7, moving from NAS Charleston to NAS Quonset Point. The squadron's last redesignation occurred on the 15th of January 1950, when it became VF-74, a designation it was to hold for 44 years. After becoming VF-74 the BeDevilers reverted to the F4U-4 Corsair and in 1951 made their first cruise with the type, returning to the Mediterranean, this time aboard the USS Franklin D. Roosevelt (CVA-42). With the Korean War raging CAG-7 was transferred to the Pacific Fleet in May of 1952 and conducted a combat cruise onboard the USS Bon Homme Richard (CVA-31). In theatre for six months VF-74 flew more than 1500 combat sorties, mainly ground attack against North Korean targets. Also during this period the squadron moved from the Corsair to the F2H Banshee, their first jet. Within 12 months the Banshee was replaced by the F4D Skyray, a Douglas product which was the Navy's first supersonic capable fighter. Armed with 4 20mm cannon and able to carry 4000lbs of ordnance the Skyray had a distinctive bat wing layout. Although only enjoying a limited service career, the last phased out of service by 1962, the Skyray holds fine memories for those who flew and worked on them. Whilst flying the Skyray VF-74 deployed to the Mediterranean a further three times, twice onboard USS Intrepid (CVA-11), now the centerpiece of the New York Intrepid Museum. The final deployment saw the squadron reunited with USS Franklin D. Roosevelt (CVA-42). By 1961, with aviation technology marching on, VF-74 had transitioned from the diminutive Skyray to the hulking F-4B Phantom II. The first of the 'Double Uglys' arrived on the 8th of July and by autumn VF-74 had a full compliment of 12. October saw their first CQ's (carrier qualifications) onboard the USS Saratoga (CV-60). The first full deployment also took place onboard 'Sara', starting in August of 1962. The next 20 years would see 15 deployments with Phantoms, 13 to the Mediterranean and two to South East Asia as part of the Vietnam War. The first Vietnam cruise is generally remembered for the tragedy it included:-on the 29th of July 1967 USS Forrestal (CV-59) suffered an ordnance explosion on deck. The aft third of the flight deck was filled with fires and explosions and the loss of life was great. VF-74 alone lost 42 enlisted personnel and 3 F-4's. Many squadron members were commended for their heroic actions whilst fighting the fires. In early 1972, after 11 years flying F-4B's, VF-74 received the newer F-4J. Between July of 1972 and February of 1973 the squadron returned to combat in Vietnam with their new steeds, this time aboard the USS America (CVA-66). During seven periods on the famous 'Yankee Station' VF-74 did not lose a single aircraft to enemy action. VF-74 was equally successful in peace, winning the CNO Safety 'S' in 1974, along with the Battle 'E'. 1975 saw them move to CVW-8 and take part in the maiden cruise of USS Nimtz (CVN-68), returning to their traditional Mediterranean theatre of operations. 1976 saw even more recognition, as VF-74 won the Adm. Joseph Clifton award-making them the top U.S. Navy fighter squadron. Phantom operations continued, until in 1981 VF-74 clocked up 20 years flying the F-4, the first Navy squadron to achieve this. Their 21st and final F-4 deployment began on the 16th of November 1982, returning to the place where F-4 deployments had begun-the Mediterranean Sea. After 21 years with the F-4 training began on it's replacement, the F-14A Tomcat, in February 1983 while the first aircraft arrived in June. By October of the same year the squadron was fully operational with the F-14, reporting to CVW-17. The first F-14 cruise began in April 1984 onboard the USS Saratoga (CV-60), ending in October of the same year. In 1985 VF-74 and VF-103 were thrust into the public eye, taking action in the fight against terrorism. On the 7th of October members of the PLO had hijacked the Italian cruise liner Achille Lauro. When the ship arrived in Syria the hijackers made their way to Egypt, where they had been promised free passage to Italy in return for the hostages lives (the Egyptians were unaware that the hijackers had already killed one hostage, the US citizen Leon Klinghoffer). Boarding an Egypt Air 737 on the night of the 10th the hijackers probably assumed they had made their escape. However they had not planned on the US Sixth Fleet, which President Reagan now ordered into action. The Saratoga launched planes to intercept the 737 and force it down, where the US Delta Force would capture the hijackers. To this end four Tomcats and an E-2C Hawkeye were launched. Although reports conflict I believe two of the F-14's were from VF-74 and the other two from VF-103. After being vectored in by the Hawkeye the F-14's took up positions to port and starboard, ahead and behind of the 737. Once the 737 pilot realised what had happened he had little choice but to follow the F-14's to Sigonella in Sicily. When the plane landed the hijackers were arrested by the Italian police, rather than Delta Force. 1986 was an equally busy year with VF-74 taking part in two operations against Libya, Operation Prairie Fire in March and Operation El Dorado Canyon on the 15th of April. The next few years saw VF-74 making regular deployments to the Mediterranean as part of CVW-17. On 11th of August 1988 VF-74 became the first fleet squadron to receive the F-14A+ (now F-14B) with arrival of Devil 101. By the end of the year the transition was complete and the squadron leader, CDR Gus Grissom, along with RIO LTJG Bob McGee, became the first crew to launch an AIM-54A from the new F-14A+. The Bedevilers next call to action was in 1990, when they took part in Desert Shield/Storm. VF-74 and CVW-17 deployed on the 7th of August, relieving the crews of the USS Eisenhower battle group. After reaching the Red Sea the squadron worked with squadrons from CVW-3 aboard the USS John F. Kennedy (CV-67). When hostilities broke out VF-74 flew many successful Combat Air Patrols (CAPs) only to find that the Iraqi Air Force unwilling to leave their Hardened Air Shelters (HAS). After 8 months the squadron returned to NAS Oceana on the 27th of March 1991, having suffered no losses. Within a year of returning from the Gulf War VF-74 were back on cruise, departing onboard the USS Saratoga on the 6th of May 1992. Notable events included taking part in support of the United Nations aid to the former republics of Yugoslavia in July. September the 14th saw a 1,700nm Bombcat sortie, dropping ordnance on the Wadi Natrun target range in Egypt. This was VF-74's first cruise qualified to carry air-to-ground ordnance. The squadron returned on the 6th of November. As usual after returning from cruise the squadron went straight into workups for the next, deploying onboard USS Constellation (CV-64) for her shakedown cruise after emerging from SLEP (Service Life Extension Program) and conducting carrier qualifications on USS Saratoga (CV-60). However August 1993 saw the decision to deploy only one F-14 squadron onboard 'Sara', as the non-TARPS squadron VF-74 were left on the beach and moved from CVW-17 to the direct command of Commander Fighter Wing Atlantic. Although not cruising VF-74 continued their reputation for excellence, taking up an aggressor role and working with various Navy and Air Force squadrons. The aircraft were painted in Su-27 style camouflage, each aircraft featuring a slight variation on the scheme. The F-14B proved to be an extremely effective aggressor, providing capabilities akin to those of the Su-27 and MiG-31. January the 20th 1994 saw VF-74's last commanding officer arrive. Cmdr. John Morrow oversaw the last months of the BeDeviler's existence and led them to on their final deployment to NAS Roosevelt Roads in February. The det saw seven air-to-air missiles fired, a 100% success rate. Amid much sadness and spirited activities VF-74 BeDevilers diestablished on the 30th of April 1994 after 50 successful years of service. Markings for VF-74 aircraft remained remarkably consistent, perhaps because they were among the last East coast squadrons to move to the F-14, thus their aircraft were delivered in low vis markings. The markings featured a red lightning bolt with a horned red face superimposed. Over the face is a sniper's sight picture. Below is an image of a VF-74 aircraft wearing an Su-27 style camouflage scheme. All VF-74 aircraft had a variation on this scheme applied during the squadron's last months of existence when it served as an unofficial aggressor squadron. At least one of these aircraft (BuNo.161432) was later used by VF-101 and VX-4 in the Su-27 scheme, although it is likely that is has since been resprayed to standard TPS greys. Thankfully the Bedevilers markings have not finally disappeared with the disestablishment of VF-74, as VF-101 has retained one aircraft in VF- 74 markings.